A straightforward approach for learning color. Making the leap to digital color is intimidating. For many, grayscale offers managable challenge - but color is shrouded in a veil of mystery. The Color Starter Kit aims to simplify this challenge with a classic strategy: observational painting. Instead of starting with color theory and color schemes, we'll focus on learning to paint what we see. Even though the goal is to illustrate fantastic imaginary scenes, I argue that still life painting is the best place to start. The videos combine classic ideas and digital techniques, with no shortage of drills and lessons to practice. 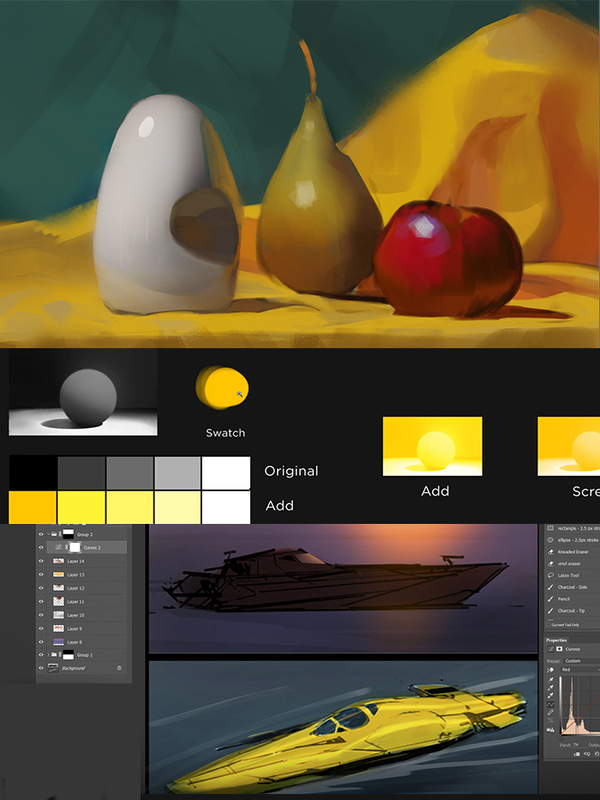 Along with the videos, you'll find a collection of high quality still life reference photos, as well as .PSD files and worksheets. Note: The "Grayscale to Color" included in this collection replaces the 2011 series of same name. It's much improved, and covers different subjects. Newer:Making Tricky SelectionsOlder:Is the Sampling Ring Useful?